This blog is a record of my learning while I was at Point England School. It was prize giving night and my adrenaline was pumping! It was my very last for my life at Pt England School, and I was in the kapa haka group. Which meant I had to come a bit earlier than the others. Once I arrived I made my way towards the Library. When the event had finally started I was told to go on stage with Gabriel to do the opening prayers before joing the kapa haka group. After doing the prayers, we scurried along to the kapa haka group that was waiting in the music room for us. Mr Burt had to do his short speech before it was our turn. It was our turn and I was feeling my goosebumps. I was really nervous, but I knew in my head that we were going to do great! We all single filed and walked onto the stage. The crowd was pretty big but it didn't get to me as much as it did before. Now we were all singing, and doing our haka, and it sounded pretty mean! When our bracket finished, we walked off the stage proudly! The following thing that happened was the yr 5 awards and item. Their item was pretty cool. Although I loved the yr 6 item! It was off the hook. Their item had to be one of my main highlights of the night. Then there was the yr 7 item, they did a live MTV on stage act of the theme song of Prince Of Belair. An old one but a good one of Will Smith. Our year 8 item on the other hand was pretty awesome to. I liked it, and by the looks of the crowd they did to! I enjoyed the evening because I got a few awards myself. 2nd academic was one of the 3 that I was most proud of. Once the night was over I felt relieved but yet again depressed that everything was over basically. The next prize giving I would attend to would be in college and I'm not just ready yet. Hey my blog viewers. Just some little facts about me. My name is Makerita. I am currently in the splendid class of room 20 attending Pt England School with an awesome teacher Ms Squires. I come from a big family of 7. Two loving and caring parents and five of us children including me. My hobbies are a bit of sport mixed with being an awesome singer. No just kidding, singing is just a hobby of mine. The person who inspires me to become anything I want, has to be my mum. She is an amazing human being, who is beautiful in every way. 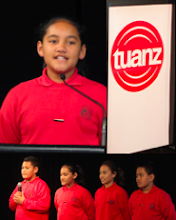 In 2011 I went to Wellington to speak at the TUANZ conference. Click here to check out my podcasts! The Pen Made Me Write It!